Precision Content is dedicated to helping organizations prepare for Content 4.0 and to find solutions for transforming content into a valuable strategic asset. We look forward to meeting you at an upcoming event. IDEAS is a two-day industry conference that you can attend virtually from the comfort of your own office. The conference includes five 60-minute concurrent sessions in two tracks, giving you a choice of 11 unique presentations. Participate live according to the published schedule or watch a recording of any session when it’s more convenient for you. 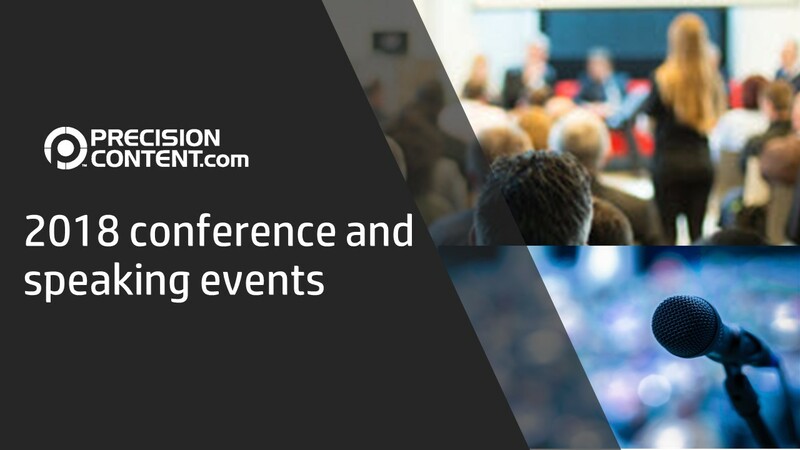 The Intelligent Content Conference features knowledgeable and engaging speakers who will deliver two full days of presentations, case studies, and panel discussions. Denver, CO April 23-25 Join the Center for Information-Development Management for the 20th Annual Content Management Strategies/DITA North America Conference in Denver, Colorado on April 23-25, 2018. We are a community of people who believe that international standards, structured content, reuse capabilities, and multiple media delivery are the directions of the future. Meet publications professionals who have implemented content management strategies and the OASIS DITA standard in their organizations. Hear from key tool developers who are actively supporting the standards-based community. New Orleans, LA Oct 21-24 To be announced.